Now that was a cool find. I’ve been hunting for JHS 5814 Black Plates after I reviewed JHS 5814 Gray Plates and was unable to find anything for a reasonable price. Ebay doesn’t have many of these. Gray plates pop up once in a while, but black plates are extra rare. Getter on these tubes is placed on the top of third mica which is elevated by about 5-6 millimeters about second one. Compared to gray plates where third mica is practically on the top of the second. So how do they sound. They sound great! Still I prefer Gray Plates (have the same preference with 5751 – which is very unusual for me since I usually hate US produced gray plates). Bass is extended and controlled. Mid range is very warm (maybe a bit too much). 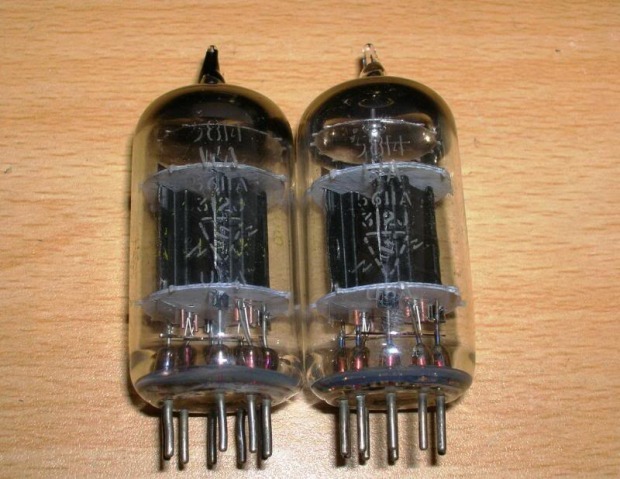 One issue I see with the tubes is that HF is not very detailed and extended, so if you already have a warm system, this tube could be too much. Sound-stage is awesome with the tubes. To prove the last point, I swapped my RCA 12au7 drivers in Dared with RCA 12au7 clear top and the music changed from being too much warmth to a great balance of warmth and transparency. Mid-range warmth remained, but HF extended, so it provided good amount of details.